Xopher in 2010 (left) and 2018 (right). In 2012, Xopher (as he’s known among the dance game community) was told by a doctor that if he didn’t lose weight, he’d be needing a heart transplant. So began an intensive and life-saving exercise program built around the arcade game series Dance Dance Revolution. It was a fun time, but as the popularity of the game began to wane a couple of years later, Xopher also left town to go to college, and while he kept playing DDR on his travels (for six years he played the same machine at a local cinema), his obesity was becoming a serious risk to his health. By 2012 Xopher was up to 325lbs, and was told by his cardiologist “You need to lose weight or you’re going to need a heart transplant by the time you are 50 years old.” Terrified of the consequences of his fitness regime (or lack of), he started hitting the gym. 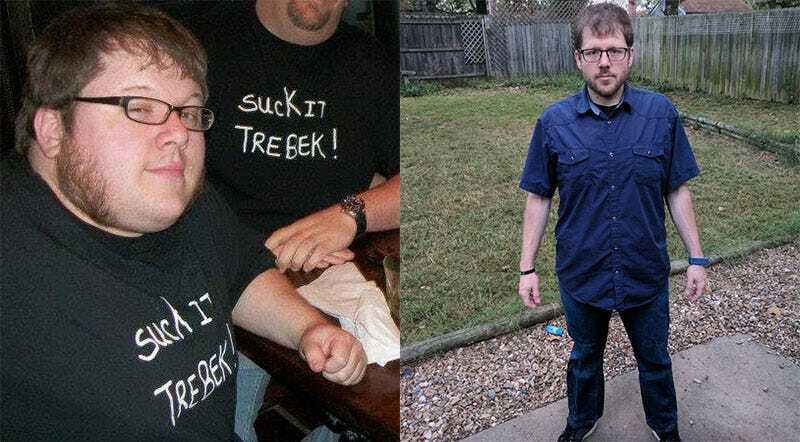 Although this was initially successful, as he lost “about 30 pounds”, by the time Christmas 2012 came around he had “ballooned back up” to over 300. A couple of years later, two things happened. The first was that Xopher found an “excellently-priced” DDR machine on eBay that just happened to be located in his town. The second was that he purchased a house, which gave him the space to store a game that massive. Without hesitation he bought the cabinet, and upon arriving to pick it up found serendipitously that it was the same DDR SuperNova unit he’d been playing on at a local movie theatre for the last six years. That was the good news; the bad news was that “it was in rough shape”. “I learned a lot about arcade machine restoration and repair”, he remembers of the two weeks that followed, but he soon had the unit operational and was ready to start playing. Beginning on standard difficulty and playing just three games a night—”I hadn’t played in so long, this is all I could handle”—Xopher found that over time his skill and stamina were slowly improving. Combined with an improved diet, within six months he’d advanced from the game’s medium-tier difficulty all the way to pulling off Perfect Full Combos on Heavy Difficulty. Xopher credits his changed body (and years of practice) for his new-found skills in DDR, as for the first time he’s now “playing at a competitive level”. He now owns a DDR cabinet that can play various versions of the game, from 3rd Mix to more recent releases, along with Stepmania. He’s also branched out and bought a Pump It Up machine, as well as StepManiaX. Having found that over the last 12 months his weight loss has got “a bit stagnant”, he’s added weightlifting to his exercise program to try and increase his muscle mass and burn more fat. He’s also hoping that bulking up his muscles will help “tighten up” the “significant amount of excess skin” he has from such drastic weight loss. That’s harder than it sounds. In 2018 Konami will only sell new DDR cabinets to ROUND1 and Dave & Busters, meaning loads of players, like Xopher or Twitch streamer happyf333tz, either aren’t near a machine or aren’t allowed to buy one for their homes. Despite this, Xopher urges everyone who has ever dabbled in the game to try out the latest iterations. Xopher has started a Facebook and Twitch page if you’d like to keep up with his adventures on the dancemat.